Travelling with kids to your summer holiday, especially if you are cooped up in a car, can seriously test your patience and indeed your sanity. We’ve done a quick poll here in the Stopover Connnections offices to come up with these top tips for taking the stress out of your car journey. If you are travelling with kids on the French autoroutes network, you don’t need to stop at one of the busy big service stations. 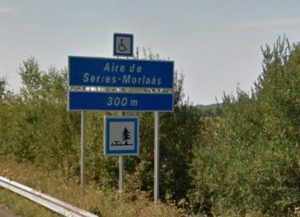 Instead, look out for one of the many ‘Aire de repos’ which are indicated on the autoroute by a picnic table and usually a WC sign. These are great little spots, equipped with toilets, picnic benches and sometimes an outdoor play area where your children can let off steam. They make a very pleasant interlude to a journey in the car and are always quieter than the main autoroute service areas. More information on the Autoroutes.fr website. If you’re travelling with kids it’s often hard to keep them occupied on a car journey. Thankfully there are numerous resources on the Internet to help you create games for children of all ages. I find Pinterest a fantastic resource. Simply type ‘car games for kids’ into the search box and you’ll be presented with all kinds of interesting ideas. Some ideas may be to create a list of things to spot en route which start with each letter of the alphabet. 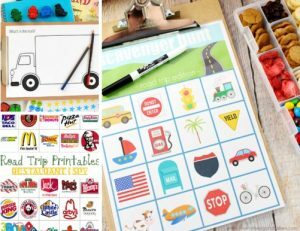 Before you leave home, get older children to read about France and the areas that you will be passing through and make their own ‘I-Spy’ lists. Before you leave, download some free audio books for the kids which they can listen to on a tablet. 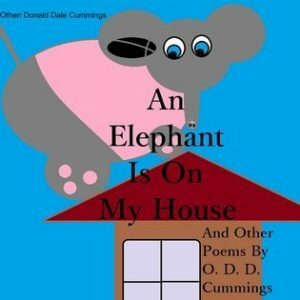 There are numerous resources on the internet with audio book suggestions for children of all ages. Make sure you take enough and make sure they are easily accessible. Most importantly, make sure they aren’t too messy! Chewy fruity sweets are a good idea and always have some surprise treats in reserve. Give each child a mini bottle of juice or water which you can top up from a larger bottle as needs be. Unless you want to be turning round to sort the kids out in the back every 5 minutes it is well worth investing in a backseat organiser. 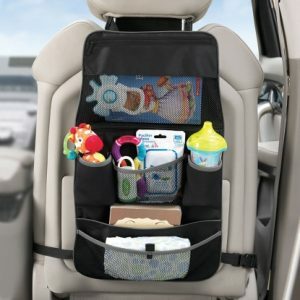 These are great for keeping things like the tablet, snacks and other toys within the child’s reach and also in one place rather than strewn across the car! If you don’t want your child to spend the whole journey complaining, don’t forget the window blinds if you are travelling in the summer. They make a massive difference to everybody’s comfort. A blanket or towel in the back of the car is also a good idea. If you have any more ideas for making a car journey with children more bearable, we would love to hear them.